While that wasn’t the announcer’s actual call to action at the FFA Tractor Technician contest, held annually at the Houston Livestock Show & Rodeo (HLSR), it could have been. Ten teams, composed of three students each, work to locate and correct five deliberately-placed “bugs,” or malfunctions, in a race to get their assigned tractor’s engine started. “This is unique in that it’s the only FFA-sanctioned tractor technician contest in the U.S.,” Karl Collins, Texas Farm Bureau member and judging coordinator for the HLSR Agriculture Mechanics Committee, said. The three-part contest culminates in the main arena at the NRG Center, where each team is given a service work order to review and 25 minutes to debug their tractor. Once the engine is started, a team member must drive the tractor around the perimeter of the arena to complete the task. The Agricultural Mechanics Committee is comprised of individuals employed in the agricultural mechanics industry. They’re responsible for overseeing the FFA Agricultural Technology and Mechanical Systems Career Development Events (CDE) held each year at HLSR. The committee has hosted the event for more than 30 years. And the contest has only grown since it started, competition supervisor and Tarleton State University professor Curtis Langley said. Langley teaches agricultural mechanics at Tarleton, training future agricultural science teachers for the classroom. He attributes the rise in participation to a renewed interest in workforce education and skilled labor training. 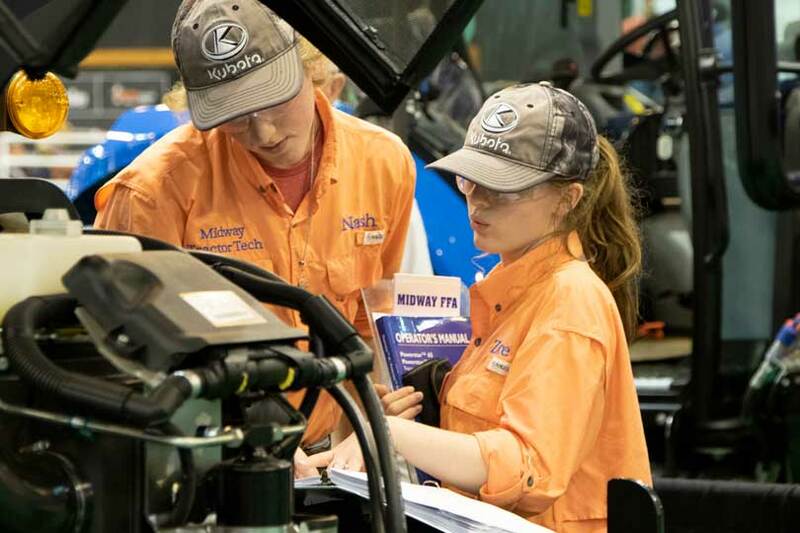 Collins, who is an account manager for AGCO Corporation, said over the past couple of decades, a stigma arose against vocational education. But that bias is now being corrected through supply and demand. As workers age out of the workforce, trained replacements have not been entering at the same rate. Students can go on to trade school or junior college and earn certification as a diesel mechanic or in another related field, Collins said. In only a short period of time, they’ll be trained and ready for employment. Judges for the competition are selected from the five manufacturers sponsoring the event—New Holland, Case IH, John Deere, ECHO Corporation and Kubota. In addition to judging the competition, Collins said the industry representatives get a chance to see potential future employees work under pressure and assess their capabilities. The winners of the competition receive a large haul of prizes donated by the sponsors, including tool sets, tool chests, hydraulic fluids and other related items to further mechanical studies and careers. Bellville FFA won this year’s competition. Bangs FFA earned second place, and Waco Midway FFA placed third. Michalik was the first place individual winner. He said the roar of a diesel engine starting had never sounded so sweet.